Background: Animal studies have confirmed that statins have neuroprotective effects during and following a subarachnoid hemorrhage; however, the therapeutic effect of statins in humans remains controversial. The interpretation of data currently available on the clinical application of statins to spontaneous subarachnoid hemorrhage is limited by the small sample sizes used in the studies, making it difficult to draw valid conclusions regarding the multiple neuroprotective effects of statins. Thus, we propose to perform a randomized double-blind placebo-controlled parallel-group clinical trial to determine the effects of atorvastatin on spontaneous subarachnoid hemorrhage, apoptosis-related factors, and serum inflammatory factors in cerebrospinal fluid and to observe its neuroprotective effect mediated by relieving vasospasm. Methods/Design: This is a randomized parallel-group placebo-controlled double-blind clinical trial. This trial will recruit 300 patients with spontaneous subarachnoid hemorrhage from the Department of Neurosurgery, 101 st Hospital of PLA (Wuxi Taihu Hospital). These patients will be equally and randomly assigned to atorvastatin (40 mg/day) and placebo control groups. Outcomes will be evaluated at baseline, 3, 5, and 14 days after hemorrhage, and 6 months after discharge. The primary outcomes will be the results of computed tomography (CT) angiography combined with CT perfusion imaging and conventional CT. The secondary outcomes will be cerebrospinal fluid analysis, blood testing (tumor necrosis factor α, vascular endothelial growth factor, interleukin-6, and C-reactive protein levels), and the Hunt-Hess classification, the results of transcranial Doppler ultrasonography, and the scores on the Glasgow Coma Scale, the Glasgow Outcome Scale, and the National Institutes of Health Stroke Scale. Discussion: The results of this trial will provide data on the clinical application and neuroregenerative effect of atorvastatin in the acute stage of spontaneous subarachnoid hemorrhage. Trial registration: This trial was registered with the Chinese Clinical Trial Registry (ChiCTR-IPR-14005395) on 18 May 2014. Subarachnoid hemorrhage mainly refers to when a traumatic or non-traumatic intracranial hemorrhage, caused by a variety of reasons, induces blood to flow into the subarachnoid space (Welty and Horner, 1990; King and Martin, 1994). Non-traumatic subarachnoid hemorrhage is also known as spontaneous subarachnoid hemorrhage. Blood gathered in the subarachnoid space can cause severe inflammation as well as an increase in nitric oxide, endothelin, oxyhemoglobin, and proinflammatory cytokine levels. The collected blood may also lead to vascular spasm, stenosis, and ischemic brain damage, resulting in early brain injury and cerebral vasospasm. Early brain injury and cerebral vasospasm are the main causes of neurological dysfunction and death after subarachnoid hemorrhage (Sobey and Faraci, 1998; Tseng et al., 2005; Rabinstein, 2011). The delayed neurological dysfunction caused by spontaneous subarachnoid hemorrhage is not primarily caused by vascular spasm, but is possibly due to early vascular dysfunction, indicating that early administration of drugs for endothelial protection may be beneficial to the prognosis of patients. Cerda et al. (2015) verified that in addition to lowering lipid, statins improve endothelial function by reducing oxygen free radical production and increasing nitric oxide synthesis in endothelial cells. Statins resist platelet aggregation (Kato et al., 2004; Antoniades et al., 2011; Luzak et al., 2012) and antagonize coagulation factor VII activity (Ural and Avcu, 2006; Dietzen et al., 2007) by elevating nitric oxide synthase activity. Statins also improve overall fibrinolytic activity, reduce the inflammatory response, maintain the integrity of the blood-brain barrier, and ease cerebral vasospasm to mitigate subarachnoid hemorrhage (Cheng et al., 2009). Many animal studies have shown that statins have neuroprotective effects on subarachnoid hemorrhage (Tseng et al., 2005; Chou et al., 2008; McGirt et al., 2009; Vergouwen et al., 2009; Garg et al., 2013; Kirkpatrick et al., 2014; Yoshimura et al., 2014), but its clinical therapeutic effects remain controversial. Garg et al. (2013) confirmed that simvastatin may relieve cerebral vasospasm after subarachnoid hemorrhage, but cannot improve patient outcome. At present, there are few data concerning clinical application of statins in patients with spontaneous subarachnoid hemorrhage, and those studies that do exist have small sample sizes. To reach a convincing conclusion, the results of a large-sample, double-blind, randomized, placebo-controlled trial are needed. Thus, the present proposed randomized, parallel-group, placebo-controlled, double-blind clinical trial has been designed to determine the effects of atorvastatin on spontaneous subarachnoid hemorrhage, apoptosis-related factors, and serum inflammatory factors in cerebrospinal fluid. This randomized, parallel-group, placebo-controlled, double-blind clinical trial will be conducted in the Department of Neurosurgery at 101 st Hospital of PLA (Wuxi Taihu Hospital). An investigator or investigator-authorized personnel will explain the benefits and risks of participation to the study to each patient, family member, and guardian and obtain written informed consent. This project has obtained the written approval of the Medical Ethics Committee of 101 st Hospital of PLA (Wuxi Taihu Hospital) (approval No. 2014-YXLL-001) and is in accordance with the guidelines of the Declaration of Helsinki, formulated by the World Medical Association. Patients with spontaneous subarachnoid hemorrhage hospitalized in the Department of Neurosurgery at 101 st Hospital of PLA (Wuxi Taihu Hospital) will be recruited to participate in this study. The 300 participants will be numbered according to their time of admission by a statistician using a table of random numbers. The participants will be equally assigned to either the atorvastatin group or a placebo control group. Doctors, patients, and assessors will be blinded regarding patient group assignments to avoid measurement bias. The treatment program for each participant will be generated using a random allocation sequence and placed in ordered, sealed, opaque envelopes. The blinded codes will be preserved by the drug administrator. If a patient has a serious adverse event and it is necessary to immediately determine the drug administered, a principal investigator of the research unit will open that patient's envelope. Once the data are unmasked, the patient will be discontinued from the trial. The clinical research associate will be informed of the result. Researchers will record the reason and date of the unmasking and sign the case report form. Patients in both groups will receive conventional treatments, such as sedation, absolute bed rest, fluid balance, and hemostasis. Atorvastatin group: in addition to the conventional treatments, patients will be orally administered atorvastatin (trade name: Lipitor; approval No. GYZZ H2005140; Pfizer Dalian Pharmaceutical Plant, Dalian, China), 20 mg twice each day for a daily total of 40 mg. Placebo control group: in addition to the conventional treatments, patients will be orally administered placebo (starch tablets with the same appearance as atorvastatin). The dosage will be consistent with that for atorvastatin. 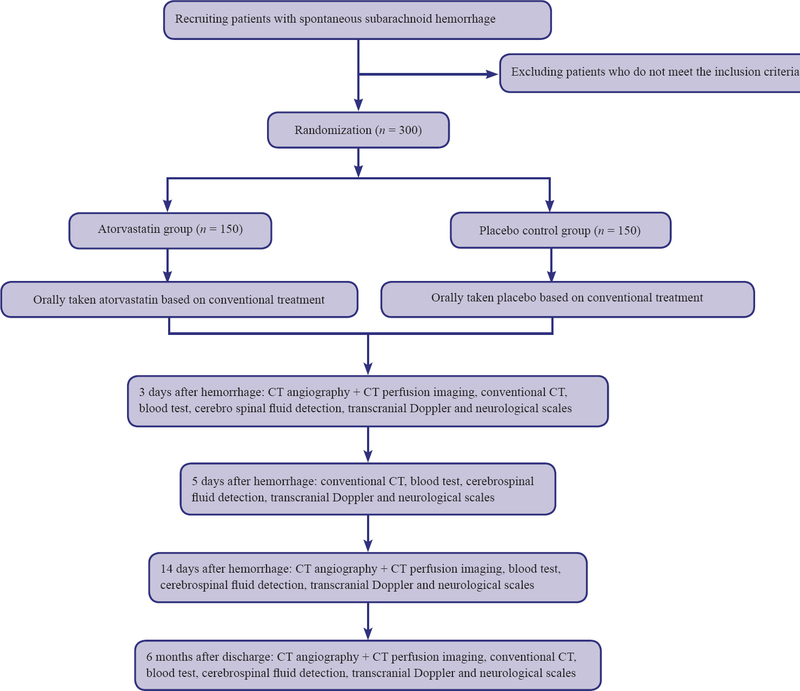 A flow chart for this clinical trial is shown in [Figure 1]. The key outcomes are listed in [Table 1]. The participants will be followed up 6 months after discharge. The patients will be requested by telephone to return to the hospital for examinations that will include CT angiography plus CT perfusion imaging, conventional CT, blood testing, cerebrospinal fluid analysis, transcranial Doppler ultrasonography, and neurological scale assessments. If a patient is lost to follow-up, the last values assessed will be considered the values for the 6-month follow-up. Adverse reactions may include gastrointestinal dysfunction, immune system dysfunction, insomnia, forgetfulness, nervous system dysfunction, pruritus, myalgia, arthralgia, and serum transaminase and phosphocreatine kinase abnormalities. To facilitate truthful reporting by patients of the changes in their conditions after drug use, the doctors will avoid asking patients leading questions. Adverse events or unanticipated side effects (symptoms, signs, and laboratory tests) will be recorded in addition to the curative effects. If severe adverse events occur, researchers will immediately take appropriate therapeutic measures. The drug will be withdrawn. Drug withdrawal time, adverse events, symptoms, occurrence time, duration, treatment, and outcome will be recorded. The investigators will report all severe adverse events to the responsible unit, reporting units, the ethics committee, the Drug Supervision and Administration Department, and the relevant administrative departments within 24 hours. The investigators will sign and date the report. The medical records will be electronically saved on a computer. The accuracy of data recorded on the case data form will be verified. Any changes or corrections will retain a clear record of the original. The investigator will record the date of changes or corrections, sign his or her name, and explain the reasons for the change (if necessary). The medical records along with any changes, deletions, or additions will be electronically saved on a computer. The audit trail will be set so that it is protected by the system and will not be able to be modified or edited by anyone. The clinical data management system will have authority management such that only authorized personnel will be allowed to operate it. The use of an electronic signature is a common means of managing electronic management systems. Only authorized personnel can log onto the system for data entry or modification or to view the data, preventing unauthorized logins and access to any clinical data so that it remains secure and confidential. In accordance with the China Drug Clinical Trial Management Specification, all records will be preserved for at least 5 years after completion of the trial. The data will be analyzed using SPSS 20.0 software. Measurement data will be expressed as the mean ± SD. 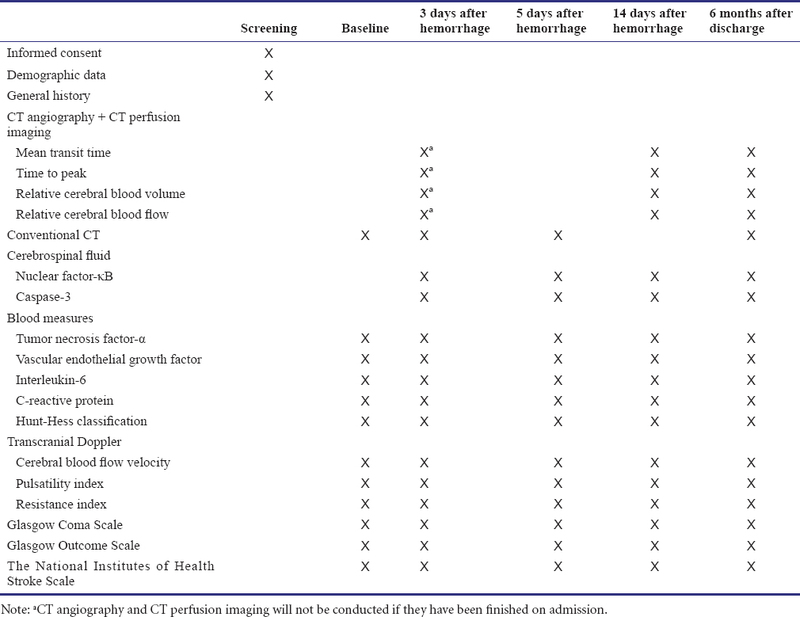 The evaluation at different time points after treatment of the results of CT angiography plus CT perfusion imaging, conventional CT, blood testing, cerebrospinal fluid analysis, transcranial Doppler ultrasonography, and neurological scale assessments will be compared using paired t-tests. The evaluation of CT angiography plus CT perfusion imaging, conventional CT, blood test, cerebrospinal fluid analysis, transcranial Doppler sonography, and neurological scale assessment results between the two groups will be compared using two-sample t-tests. A value of P < 0.05 will be considered statistically significant. An intention-to-treat analysis will be used for all patients who have been assigned random numbers by the randomization procedure. If any measurements in the medical records or outcome measures are found to be incomplete during the statistical analysis, the final data obtained will be considered the final result for the purpose of the statistical analysis. JHC, one of the authors, will be responsible for quality assurance and control. A clinical research associate assigned by the sponsor will visit the hospital regularly to ensure that the protocol has been strictly followed and that all data are correctly recorded. The researchers will implement standard operating procedures for clinical trials before, during, and after the trial. During the trial, inspectors will monitor the correctness and integrity of the data using case registration forms. Researchers will be provided with training to enable uniform recording methods and judgment standards. Researchers will carefully record all information on case report forms to ensure that the data are correct and reliable. The investigators will use normal reference ranges as standards to determine abnormal laboratory test results. All observations and findings will be checked to ensure data reliability and to ensure that the conclusions come from the original data. In the clinical trials and data processing stage, there will be corresponding data management measures. Active measures will be taken to control the dropout rate to within 20%. Sedation, absolute bed rest, fluid balance, and hemostasis are for the symptomatic treatment of patients with spontaneous subarachnoid hemorrhage. Such conventional treatments cannot effectively restore the patient's neurological condition. Thus, the goal of this study is to confirm the multiple neuroprotective effects of atorvastatin, including reducing inflammation, relieving vasospasm, improving endothelial cell function, and confronting blood coagulation activity in the treatment of spontaneous subarachnoid hemorrhage through this clinical trial. It remains poorly understood whether the addition of atorvastatin to the treatment protocol will improve outcome in the recovery of neurological function. The most common adverse reaction of atorvastatin is myopathy, which resolves after drug withdrawal because it occurs with atorvastatin administration in a dose-dependent manner (Hermann et al., 2006; Soininen et al., 2006; Abdelbaset et al., 2014). The effect of atorvastatin on liver function is limited (Gershovich and Lyman, 2004; Tikkanen et al., 2013; Kalantari and Naghipour, 2014). Therefore, atorvastatin is expected to become a relatively safe method for the treatment of spontaneous subarachnoid hemorrhage. If this large sample size, randomized, parallel-group, placebo-controlled, double-blind clinical trial verifies the effectiveness of atorvastatin, this drug will be considered effective for the treatment of spontaneous subarachnoid hemorrhage. JHC and YHW conceived and designed the trial procedure, wrote the paper, and approved the final version of the paper for publication. This paper was screened twice using CrossCheck to verify origi-nality before publication. Abdelbaset M, Safar MM, Mahmoud SS, Negm SA, Agha AM (2014) Red yeast rice and coenzyme Q10 as safe alternatives to surmount atorvastatin-induced myopathy in hyperlipidemic rats. Can J Physiol Pharmacol 92:481-489. Antoniades C, Bakogiannis C, Leeson P, Guzik TJ, Zhang M-H, Tousoulis D, Antonopoulos AS, Demosthenous M, Marinou K, Hale A, Paschalis A, Psarros C, Triantafyllou C, Bendall J, Casadei B, Stefanadis C, Channon KM (2011) Rapid, direct effects of statin treatment on arterial redox state and nitric oxide bioavailability in human atherosclerosis via tetrahydrobiopterin-mediated endothelial nitric oxide synthase coupling. Circulation 124:335-345. Cerda A, Fajardo CM, Basso RG, Hirata MH, Hirata RD (2015) Role of microRNAs 221/222 on statin induced nitric oxide release in human endothelial cells. Arq Bras Cardiol 104:195-200. Cheng G, Wei L, Zhi-dan S, Shi-guang Z, Xiang-zhen L (2009) Atorvastatin ameliorates cerebral vasospasm and early brain injury after subarachnoid hemorrhage and inhibits caspase-dependent apoptosis pathway. BMC Neurosci 10:7. Chou SH, Smith EE, Badjatia N, Nogueira RG, Sims JR, Ogilvy CS, Rordorf GA, Ayata C (2008) A randomized, double-blind, placebo-controlled pilot study of simvastatin in aneurysmal subarachnoid hemorrhage. Stroke 39:2891-2893. Dietzen DJ, Page KL, Tetzloff TA, Bohrer A, Turk J (2007) Inhibition of 3-hydroxy-3-methylglutaryl coenzyme A (HMG CoA) reductase blunts factor VIIa/tissue factor and prothrombinase activities via effects on membrane phosphatidylserine. Atertio Thromb Vasc Biol 27:690-696. Ehrlich G, Kirschning T, Wenz H, Hegewald AA, Groden C, Schmiedek P, Scharf J, Seiz-Rosenhagen M (2016) Is there an influence of routine daily transcranial doppler examination on clinical outcome in patients after aneurysmal subarachnoid hemorrhage? World Neurosurg doi: 10.1016/j.wneu.2015.11.091. Garg K, Sinha S, Kale SS, Chandra PS, Suri A, Singh MM, Kumar R, Sharma MS, Pandey RM, Sharma BS, Mahapatra AK (2013) Role of simvastatin in prevention of vasospasm and improving functional outcome after aneurysmal subarachnoid hemorrhage: a prospective, randomized, double-blind, placebo-controlled pilot trial. Br J Neurosurg 27:181-186. Gershovich OE, Lyman AE (2004) Liver mitochondrial respiratory function and coenzyme Q content in rats on a hypercholesterolemic diet treated with atorvastatin. Pharmacotherapy 24:150-154. Gocan S, Fisher A (2008) Neurological assessment by nurses using the National Institutes of Health Stroke Scale: implementation of best practice guidelines. Can J Neurosci Nurs 30:31-42. Hermann M, Bogsrud MP, Molden E, Åsberg A, Mohebi BU, Ose L, Retterstøl K (2006) Exposure of atorvastatin is unchanged but lactone and acid metabolites are increased several-fold in patients with atorvastatin-induced myopathy. Clin Pharmacol Ther 79:532-539. Kalantari S, Naghipour M (2014) Statin therapy and hepatotoxicity: Appraisal of the safety profile of atorvastatin in hyperlipidemic patients. Adv Biomed Res 3:168. Kato T, Hashikabe H, Iwata C, Akimoto K, Hattori Y (2004) Statin blocks Rho/Rho-kinase signalling and disrupts the actin cytoskeleton: relationship to enhancement of LPS-mediated nitric oxide synthesis in vascular smooth muscle cells. Biochim Biophys Acta 1689:267-272. King WA, Martin NA (1994) Critical care of patients with subarachnoid hemorrhage. Neurosurg Clin N Am 5:767-787. Kirkpatrick PJ, Turner CL, Smith C, Hutchinson PJ, Murray GD, STASH Collaborators (2014) Simvastatin in aneurysmal subarachnoid haemorrhage (STASH): a multicentre randomised phase 3 trial. Lancet Neurol 13:666-675. Luzak B, Rywaniak J, Stanczyk L, Watala C (2012) Pravastatin and simvastatin improves acetylsalicylic acid-mediated in vitro blood platelet inhibition. Eur J Clin Invest 42:864-872. McGirt MJ, Garces Ambrossi GL, Huang J, Tamargo RJ (2009) Simvastatin for the prevention of symptomatic cerebral vasospasm following aneurysmal subarachnoid hemorrhage: a single-institution prospective cohort study. J Neurosurg 110:968-974. Nina P, Schisano G, Chiappetta F, Luisa Papa M, Maddaloni E, Brunori A, Capasso F, Corpetti MG, Demurtas F (2001) A study of blood coagulation and fibrinolytic system in spontaneous subarachnoid hemorrhage. Correlation with hunt-hess grade and outcome. Surg Neurol 55:197-203. Okamura K (2014) Glasgow Coma Scale flow chart: a beginner's guide. Br J Nurs 23:1068-1073. Rabinstein AA (2011) Secondary brain injury after aneurysmal subarachnoid haemorrhage: more than vasospasm. Lancet Neurol 10:593-595. Smith A, Wu AHB, Lynch KL, Ko N, Grenache DG (2013) Multi-wavelength spectrophotometric analysis for detection of xanthochromia in cerebrospinal fluid and accuracy for the diagnosis of subarachnoid hemorrhage. Clin Chim Acta 424:231-236. Sobey CG, Faraci FM (1998) Subarachnoid haemorrhage: what happens to the cerebral arteries? Clin Exp Pharmacol Physiol 25: 867-876. Soininen K, Niemi M, Kilkki E, Strandberg T, Kivist KT (2006) Muscle symptoms associated with statins: a series of twenty patients. Basic Clin Pharmacol Toxicol 98:51-54. Suarez JI (2015) Diagnosis and management of subarachnoid hemorrhage. Continuum (Minneap Minn) 21:1263-1287. Tikkanen MJ, Fayyad R, Faergeman O, Olsson AG, Wun CC, Laskey R, Kastelein JJ, Holme I, Pedersen TR (2013) Effect of intensive lipid lowering with atorvastatin on cardiovascular outcomes in coronary heart disease patients with mild-to-moderate baseline elevations in alanine aminotransferase levels. Int J Cardiol 168:3846-3852. Tseng MY, Czosnyka M, Richards H, Pickard JD, Kirkpatrick PJ (2005) Effects of acute treatment with pravastatin on cerebral vasospasm, autoregulation, and delayed ischemic deficits after aneurysmal subarachnoid hemorrhage: a phase II randomized placebo-controlled trial. Stroke 36:1627-1632. Ural AU, Avcu F (2006) HMG-CoA reductase inhibitors may affect thrombin generation by reducing factor VII activity in hyperlipidemic patients. Thromb Res 118:665-666. Vergouwen MD, Meijers JC, Geskus RB, Coert BA, Horn J, Stroes ES, van der Poll T, Vermeulen M, Roos YB (2009) Biologic effects of simvastatin in patients with aneurysmal subarachnoid hemorrhage: a double-blind, placebo-controlled randomized trial. J Cereb Blood Flow Metab 29:1444-1453. Welty TE, Horner TG (1990) Pathophysiology and treatment of subarachnoid hemorrhage. Clin Pharm 9:35-39. Wilson JT, Pettigrew LE, Teasdale GM (1998) Structured interviews for the Glasgow Outcome Scale and the extended Glasgow Outcome Scale: guidelines for their use. J Neurotrauma 15:573-585. Yoshimura Y, Murakami Y, Saitoh M, Yokoi T, Aoki T, Miura K, Ueshima H, Nozaki K, SSS Research Group (2014) Statin use and risk of cerebral aneurysm rupture: a hospital-based case-control study in Japan. J Stroke Cerebrovasc Dis 23:343-348.